Carlyle and Astin prepare to strut their stuff. David Paymer, Adam Arkin, Sonia Braga. Rated PG-13. Steve is one dedicated guy. He’s also more than a little crazy. As a love-struck eight-year-old, he promised Lisa that he would meet her on the fifth day of the fifth month of the fifth year of the new millennium at Marilyn Hotchkiss’ Ballroom Dancing and Charm School. Now, at 48, he’s ready for the reunion, and he’s barreling down the highway at full speed, hot with anticipation. Steve doesn’t make it. 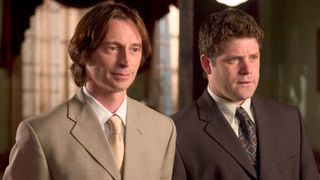 A car crash derails his deranged plan, and his last best hope of making it to school on time is Frank (Robert Carlyle), who witnesses the accident and calls the police. During the course of a series of flashbacks, Steve (John Goodman) explains his tale of desperate love to Frank, and Frank, a recent widower and a hopeless romantic in his own right, vows to carry on the search for the elusive Lisa. So he hops into his bakery truck and heads to dancing school. Needless to say, Marilyn Hotchkiss’ Ballroom Dancing and Charm School is built, ever so precariously, on one of the most absurd premises in recent memory. It’s cute and campy enough, but in what plane of reality do adults wait 40 years to reunite with their prepubescent sweethearts? And why would Frank drop everything to embark on this lunatic mission? Well, the answer is simple. If he didn’t, there would be no movie. Perhaps that wouldn’t have been such a bad thing. Marilyn Hotchkiss’ Ballroom Dancing and Charm School, which deserves some kind of gonzo award for its awkward, instantly forgettable title, was directed by Randall Miller. Clearly, it is the movie he was born to make, since he’s made it not once but twice. Marilyn Hotchkiss’ Ballroom Dancing and Charm School (1990) was an obscure short film about Steve and Lisa’s first meeting. Now, flying in the face of sound marketing strategy, comes this unlikely sequel. Miller recruited William Hurt to narrate the original, but he’s outdone himself for the second go-round, assembling a cast featuring the talents of Marisa Tomei, Mary Steenburgen, Sean Astin, Adam Arkin and Sonia Braga. They are all put to very silly use. They dance with varying degrees of ineptitude, while Frank searches for Lisa. (Instead, he finds Tomei, and for that he should be thankful.) By the time Lisa arrives for the movie’s ho-hum climax, it’s practically an afterthought. Marilyn Hotchikiss is a harmless enough flight of far-fetched fancy, but whatever slight charms it might boast are undermined by its utter lack of touch with reality.